“This is what the Dream Tour should be like all the time” – Bruce Irons, 2008 Rip Curl Pro Search Champion, following the event in Bali. Truer words could not have been spoken from Bruce following his win in Bali. For as long as I can remember there have been those who dismiss the WCT as unfriendly to progression, limiting, and a tour that is suited more for the best competitors and not necessarily the best surfers in the world. While at times those points of view may hold water, much of the 2008 Rip Curl Pro Search (especially the opening round) captured why it is the Dream Tour is called by that name. With that quote, however, Bruce also gave us some insight into the thought process behind his decision to leave full-time tour life behind and freesurf the best waves of the world. Slogging through mushy beach-breaks, sitting on competitors, inducing interference, and everything else that takes away from the spectacle of watching the some of the world’s best surfers in action on amazing waves all go to remove some of the luster off of the Dream Tour. When these types of things come into play, of course going the freesurfing route while picking and choosing the top events to participate in will be a more desirable route for a lot of surfers. So how can this be fixed so that the Dream Tour can be truly be just that, a Dream Tour? I’m not exactly sure. Cut down the number of competitors so events can be completed in 1-2 days of the best swell during the waiting period? Longer heats? Eliminating locations like Brazil that just don’t seem to produce world-class waves on a consistent basis? There are a whole host of suggestions that have been thrown out throughout the years. I’m curious though, with the way the tour is currently set-up, what some of the ideas and thoughts our 5ones peeps have as ways to improve on something that’s already great, but could be even better. Aside from Bruce heading home with a huge win under his belt, the Rip Curl Pro Search saw all of the top seeds fail to take advantage of Kelly Slater’s Rd. 3 upset loss to Tiago Pires. Andy Irons, Bede Durbidge, Mick Fanning, and Joel Parkinson all let golden opportunities to make up ground in the world title race slip through their hands, all suffering losses in the 4th round. The only other surfer on tour with even an outside chance of catching Slater, Taj Burrow, did make it through the gauntlet that was Rd. 4. However his run would end in the quarterfinals as an absolutely firing Chris Ward sent the Aussie title hopeful packing, and essentially ending any hope Taj had of winning it all this year. 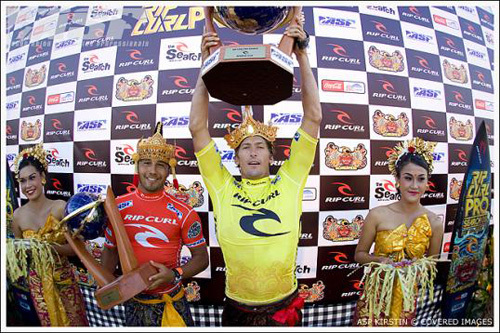 Congratulations Bruce Irons, the 2008 Rip Curl Pro Search ‘Somewhere in Indonesia’ Champion! Current ASP World Tour Top 10 as we head into the Rip Curl Pro Somewhere in Indo. While we are only about half-way through the 2008 ASP World Tour, we are already becoming witnesses to one of the all-time great performances throughout the course of the surfing year. Eight-time world champion Kelly Slater defeated last year’s champ Mick Fanning in the final of the Billabong Pro Jeffreys Bay earlier today for his fourth victory at the prestigious South African break. It sure does appear that way. 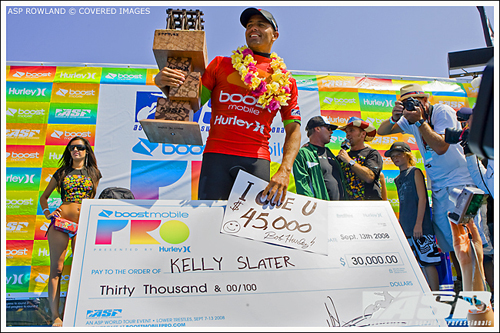 Congratulations Kelly Slater, winner of the 2008 Billabong Pro Jeffreys Bay! There are few breaks in the world that contain the prestige and history of South Africa’s Jeffreys Bay. Its a wave unlike any other that has been known to bring out the best in many of the greatest surfers to ever step foot on a board. Tomson, Curren, Occy, Slater, and so many other surf legends have seen J-Bay be the site of some of their most impressive and inspired performances. And now with the arrival of the 2008 Billabong Pro Jeffreys Bay upon us this week, we have another opportunity to witness a few of the worlds best on one of its greatest waves. The holding period for the Billabong Pro J-Bay, the fifth of 11 events on the 2008 ASP World Tour, is set to open on July 10. While for us it means a chance to see the top 44 and others do work at Jeffreys Bay , for everyone taking part in the tour it only means one thing – possibly the last hope to putting an end to Kelly Slater cruising through to his 9th world championship. The stop at Jeffreys Bay has solidified itself years ago as one of the truly special events of each year. The chance to see another round of memorable performances is something that shouldn’t be passed up. Even those who aren’t huge WCT followers can appreciate the magic of seeing these guys carve up the endless walls that J-Bay is known and loved for.